Genevieve is a new perfume by 1907 for women and men and was released in 2018. The scent is chypre-spicy. The longevity is above-average. It is still in production. This fragrance is part of the "Beneath the Surface" collection. That chypre genoveva's pretty youthful! 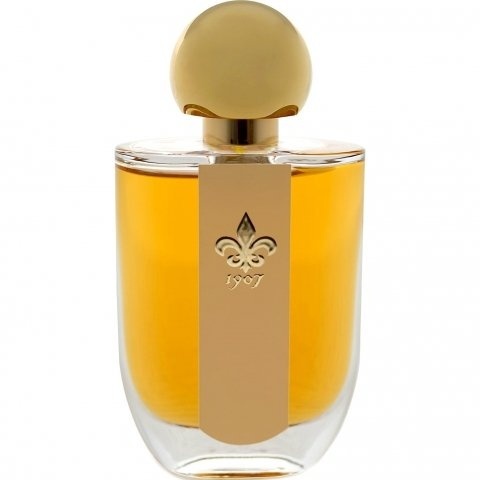 1907 is a young Slovak niche perfumery run by its founder Eva Skovranova. Whether she herself is the perfumer behind the brand's own creations is not quite clear from the sources on the Internet. The brand's portfolio currently consists of two collections: On the one hand, the basic collection "1", which comprises eleven rather puristically designed flacons with minimalist and objective (English) one-word titles such as "Cedar" and "Almond" (these are nevertheless perfumes composed through with a fully pronounced fragrance pyramid); on the other hand, the luxury collection "Beneath the Surface", which consists of only two fragrances, namely "Mon Ame" and "Genevieve" (luxury is then apparently more French than English). Our prices are 114 euros and 170 euros respectively for a 100 ml bottle in our own online perfumery, which, in addition to our own productions, also carries a well-chosen and quite extensive range of (other) niche brands. In the real world (if we postulate the existence of one from the philosophical point of view) the 1907 fragrances are only available in two shops each in Slovakia and France and one in Bilbao (Spain). The name and appearance of the brand can be described as moderately historicizing; the Internet presence does not claim to be a scoff, but reveals that "1907" is a new start with new recipes and ideas. The bridge to the past is built by the fact that the grandmother of the founder is said to have been a fragrance supplier of some (probably Hungarian) count families, the lily symbol is said to stand for noblesse and purity, but also for the famous violet-lily cologne of the grandmother. The name "1907" stands for the year of Muhme's birth; to me this seems to be a rather bold leap back in time, since it can hardly be assumed that grandma already supplied Count Andrassy as a newborn. On a realistic view, she will certainly not have done this until her late twenties at the earliest, but it is obvious that a date like "1939", for instance, would evoke unwanted associations in this day and age, one would rather refer back to the Belle Epoque, this is never wrong: Collonil's Nobel shoe cream series trade under the name "1909", and if one looks long enough, one will also find an upscale consumer product called "1908". Through a generous donation from Angua, I came into possession of original samples (2 ml) of the two luxury fragrances of the house and could thus avoid ordering them from the manufacturer for the completely outrageous, not to say prohibitive price of 7 euros each. The 1907-GmbH would do better to give away the scent patterns generously, in order to spread the fame of the house more easily beyond the Slovak province, because - and this brings me to the scent - both scents are of excellent quality. Both are suitable for a large olfactory depth dimension and a wealth of scent motifs, accompanied by a perceptible scent progression, both the charisma of value and nobility, both a certain (though not oppressive) heaviness (or rather solidity), both a (at least slightly) above-average projection and above all durability. Both are unisex with a possibly slight tendency to femininity. Both are also characterized by an interesting tension between tradition and modernity, whereby Genevieve is the one in which the memory of great fragrance pastes takes centre stage and a shot of innovation loosens up the whole. For me, certain fresh, light, almost ozone-like motifs (which cannot be further identified and may be synthetically conditioned, but seem highly appropriate) exhibit a modern, unclassical trait; they illuminate the dense, firm, heavy chypre fabric from the inside as if it were light and airy - I like that very much. And as old-fashioned as the name "Genoveva" is: this is at least Bauhaus, if not deconstructivism. Unfortunately, I did not find the right dosage. Having become wise from damage, I dosed Genevieve very sparingly at first for the demonstration with the little nose at my side, so she found it very nice. At the next test day I got a little more courageous (but by no means dieseling) and the cry "Oh God! Fervent deer!" (this is her normal reaction to chypres). Around noon of the same day my (by no means anosmic) favourite colleague already said "Fragrance? Is there a scent? Ah yes, beautiful somehow". Should I buy Genevieve, which would already appeal to me, I will still have to work on it. Even though England always has London in mind at the same time, I would like to focus on the city of Bristol. Owing to the fact that Bristol has two universities, the population structure seems to be quite young and that brings a lot of life and mobility to this city, at the same time historical and traditional things seem well preserved. This is a mixture that I really like and even though we unfortunately only had a half-day stay in Bristol - which of course only allows a superficial assessment of the city - Bristol was reserved for a city trip. So we take two buses to Clifton. It's a ride worth taking. On the one hand, because Clifton is so pretty to look at and on the other, because it has a nice retail structure and many cosy restaurants. Nothing seems over-excited or hectic here, but everything has grown. Our goal is not the nearby zoo of Bristol, but a small niche perfumery. "Genevieve" is the name of the fragrance from the Slovak company in 1907 and belongs to the "Beneath the Surface" collection. How fitting. Not only the basses of "Angel" (the Bristol band Massive Attack) rumble imaginarily in endless loops in my stomach, no, the scent joins it. He's rumbling through his nose, head and belly. Only released this year and still I am surrounded by a classic chypre fragrance in vintage style. Captivating, powerful and yes, really of old-fashioned and balsamic depth. The aldehyde is enriched with clove and yet it contains the iris or rather creamy and somewhat bitter iris butter. It dominates the perfume throughout the entire wearing period and only lets lily of the valley and rose shine through here and there. At the end of the course I find beside the iris butter still the tonka bean and little of the sandalwood well recognizable. "Genevieve" smells like a passion that is difficult to control, like a fire held in check by conventions. You can't imagine what a liberation strike might look like. The endurance of the perfume is at least ten hours. Both "Genevieve" and "Mon âme" appealed to me during the test. While "Genevieve" is a soft and old-fashioned chypre scent, "Mon âme" smells fresher, harshly disturbing and somewhat more contemporary. Actually, I would see both perfumes as unisex scents if man likes chypriges. Finally a big thank you for a nice afternoon to the shopkeeper of "Shy Mimosa", Maria Kabakova-Upfold. Write the first Review for Genevieve!